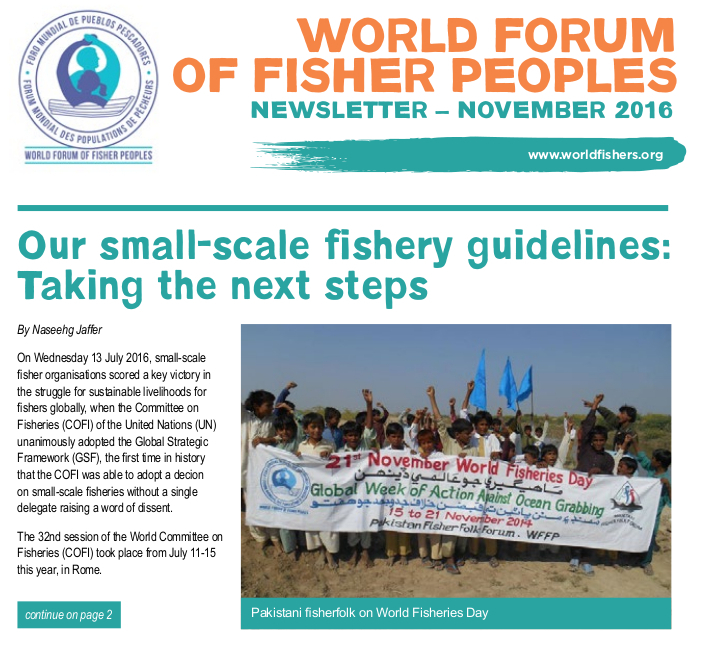 In the run-up to COP21 in Paris, WFFP denounces ‘false solutions’ to climate change and instead call on governments to implement the International Small-Scale Fisheries guidelines. Small-scale fisherfolk across the world provide the socially and ecologically just solutions. 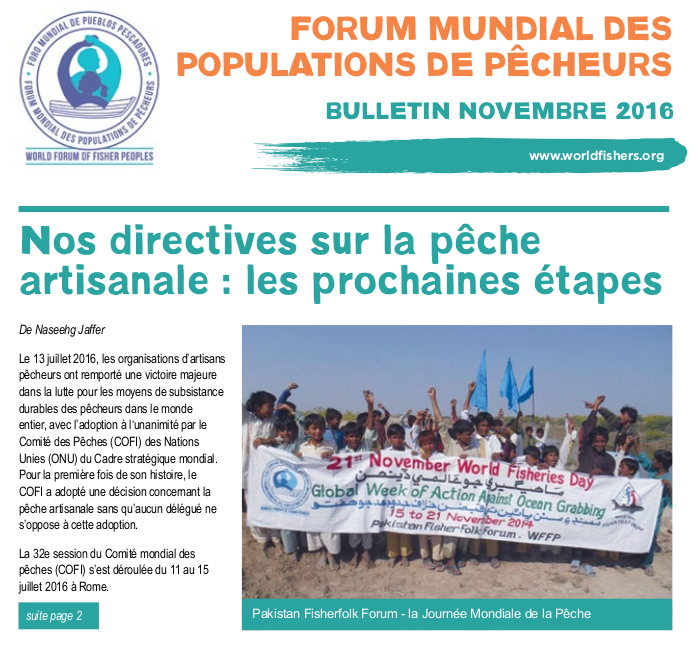 On this day, 18 years ago, the World Forum of Fisher Peoples (WFFP) was founded by a number of mass-based small-scale fisher people organisations from the Global South. WFFP was established in response to the increasing pressure being placed on small-scale fisher people as a result of the onslaught of neoliberal globalization. 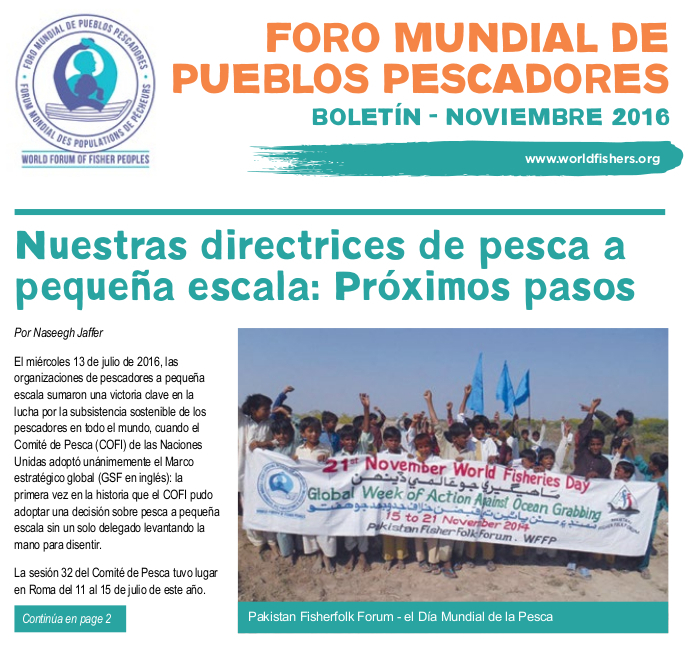 WFFP was formed to fight for the rights of small-scale fishers and a world where the needs of people and the planet come before profit. All these years later, this fight is as relevant as ever. In the context of accelerating climate change and destruction of marine ecosystems, small-scale fishers face the threat of their customary fishing and living areas being privatized to benefit powerful interests, often under the guise of conservation. Multinational corporations, philanthropic foundations and environmental NGOs support these so-called conservation schemes, whereby, in the name of ‘sustainability’, large segments of common property land and water become privatized and commodified for non-fishery uses. The latest variant of such conservation schemes comes under the name ‘Blue Carbon’. This new mechanism needs to be seen as part of the larger push for false solutions through privatization, commodification and the ‘green economy’, as we have seen especially since Rio+20. In Rio, the idea that we need to “sell nature in order to save it” was pushed forward stressing that nature would only be fully appreciated and protected if we put an economic value on it. Like with REDD+ concerning forests, blue carbon projects aim to create a market for the ‘service’ provided by wetlands: carbon storage and carbon credits. Blue carbon projects are therefore about reducing wetlands into a tool to capture and store carbon – no matter what they used to be before (e.g. fishing grounds). Blue carbon could therefore have the same effects in wetlands areas as REDD+ has had in forest areas, i.e. expulsion of communities, reducing customary or community access rights, shifting community labour away from fishing towards carbon sequestration. In short: ocean grabbing. Other privatisation and commodification programmes, such as the recently abolished Global Partnership for Oceans, the ’50in10′ and the Coastal Fisheries Initiative, are increasingly wrapped in rhetoric of ‘sustainable livelihoods’, ‘community empowerment’ and ‘poverty reduction’. The newest tendency is for the groups behind such programs to also claim an interest in implementing UN instruments such as International Guidelines on Securing Sustainable Small-scale Fisheries, but according to the Naseegh Jaffer, General Secretary of the WFFP the alarm bells should ring when such claims are made. The WFFP played a key role in developing the international small-scale fishery guidelines together with the UN Food and Agricultural Organisation (FAO) and is wholly committed to ensure that they are also implemented. The WFFP will therefore continue to work closely together with the FAO. Together with other small-scale food producers, we, the small-scale fishers, have the socially and ecologically just visions and solutions to climate change. Small-scale fishers use non-industrialised methods of harvesting (passive gear or manually hauled), which has a low impact on the ecosystem and a low carbon footprint. Aside from being ecologically just, small-scale fisheries also provide a livelihood for 90% of the some half a billion people involved in capture fisheries – half of which are women. Today, we take to the streets across the world together with allies and friends to celebrate World Fisheries Day. On this day, we denounce the false solutions that lead to ocean grabbing and undermine our struggle to realize the small-scale fisheries guidelines. I would not call it ocean grabbing as search but I do agree that it is the fishers to come up with the guidelines and solutions to climate change.However all these needs the involvement of all players as fishers still needs capacity building on how to implement the solutions they are aware of. Giving a value to natural environment or species does not means privatization. We have to be cautious and not mix both concepts. It is obvious that support for nature conservation ( by the general public) means that a benefit value has to be identified. That can be done by a more human size business approach instead of the giant multinational take over. Down with false solutions, forward with real solutions from small scale fishers! We want system change not climate change!